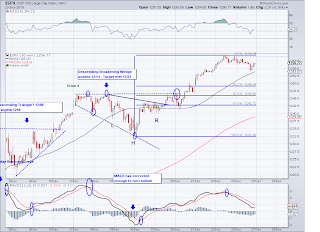 The market broke the inverse H&S pattern I was speculating on last week but the drive to the low did not break 1172 so the market seems to be stuck in a trading range. 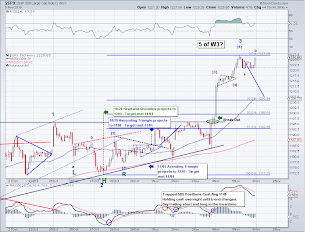 This type of sideway movements usually are found in the 4th wave of Elliott Wave counts. 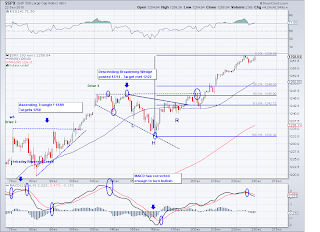 And the fact that the market is holding up without the 28 Fib retracement from the rally from 1040, leads me to think there is further upside coming. 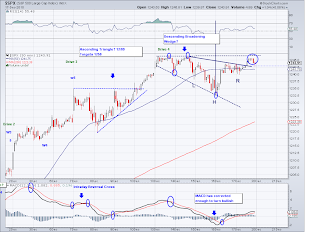 This is looking more like a correction at this point and it also seems to be forming a broadening wedge, which is a bullish sign. So we'll see how much longer the market goes in this range, as long as 1172 holds we might get a Christmas rally after all. if it doesn't then it's time to stay short. 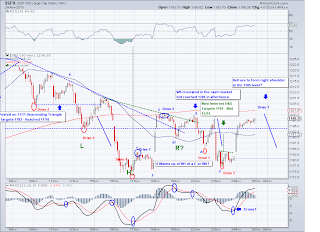 I am currently holding my FXI from last week and ahead by a few points. 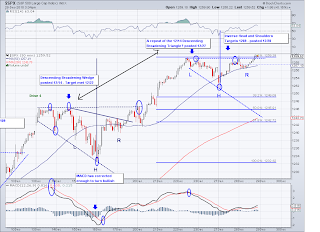 Market Update - November 24th - More upside and then 1180's? 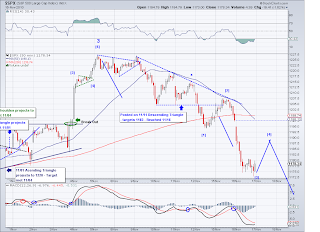 The close today not only tested the 1190-95 area but broke thru the bearish trendline, which turns the short term trend bullish. Give then fact that we're entering the holidays, I lean towards more upside with today's solid close. 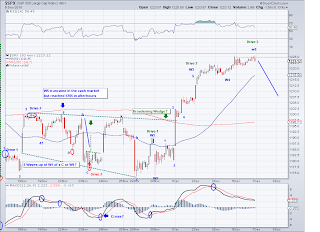 And if the next session brings us further upside then I will attempt a short again and go long at the level I watch. 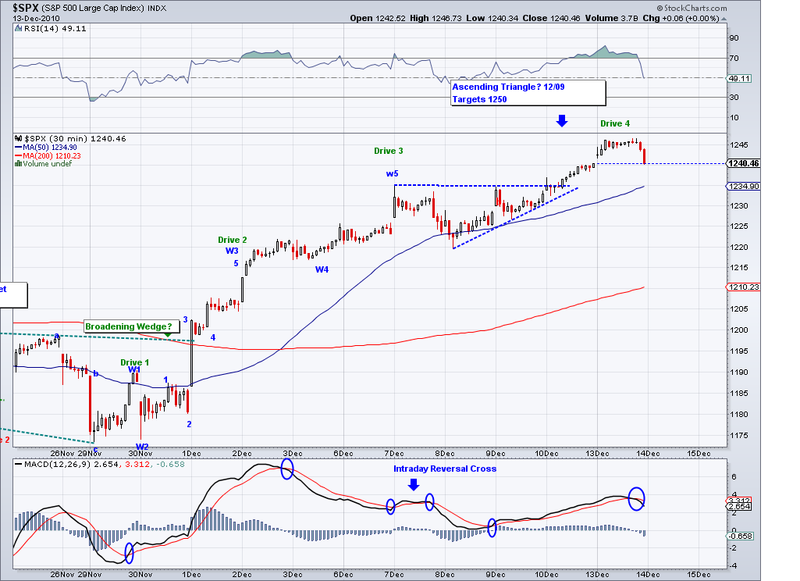 I sold my longs today at 1191 and shorted prematurely and violated one of my rules by holding on a bit too long. So I stopped it at 1196 and I am 100% cash right now. 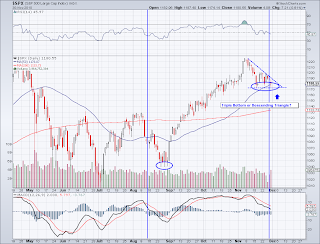 While not a perfect Descending Triangle Pattern. 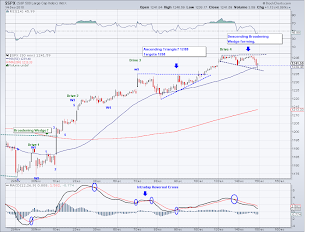 I think the price action justifies the assumption of this possibility. 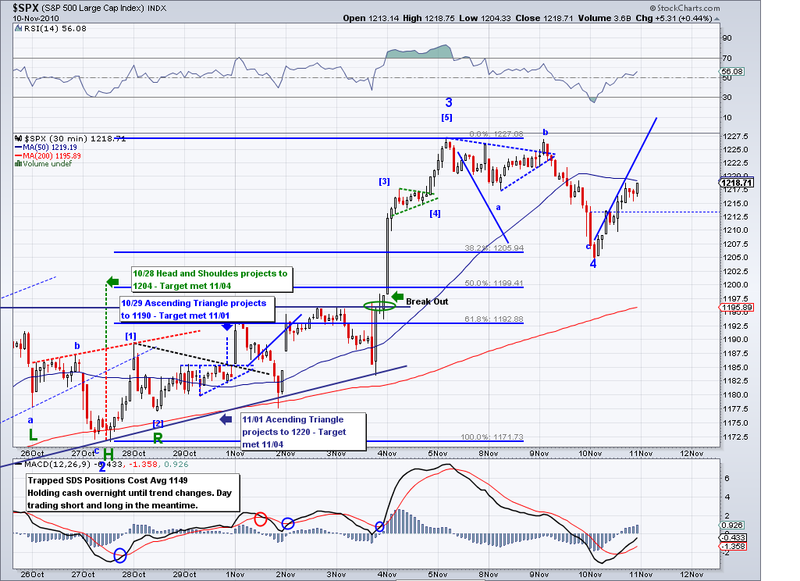 If this is right, the target in the S&P would be around 1130. 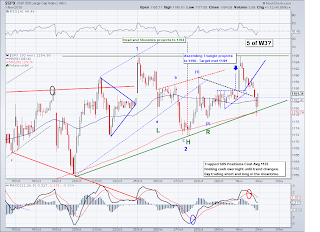 I sold all my longs at 1191 and went short, I am assuming the market will respect the descending bearish trendline. 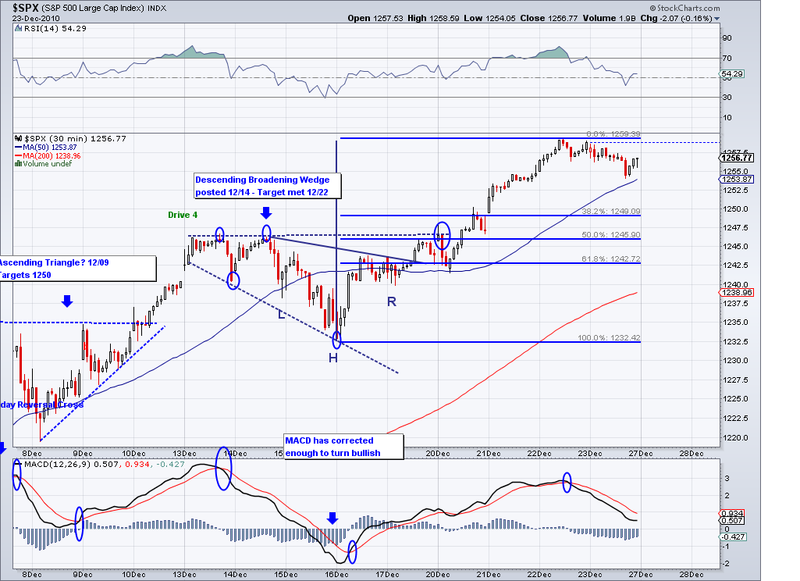 If the market breaks above it, then it will invalidate this pattern. 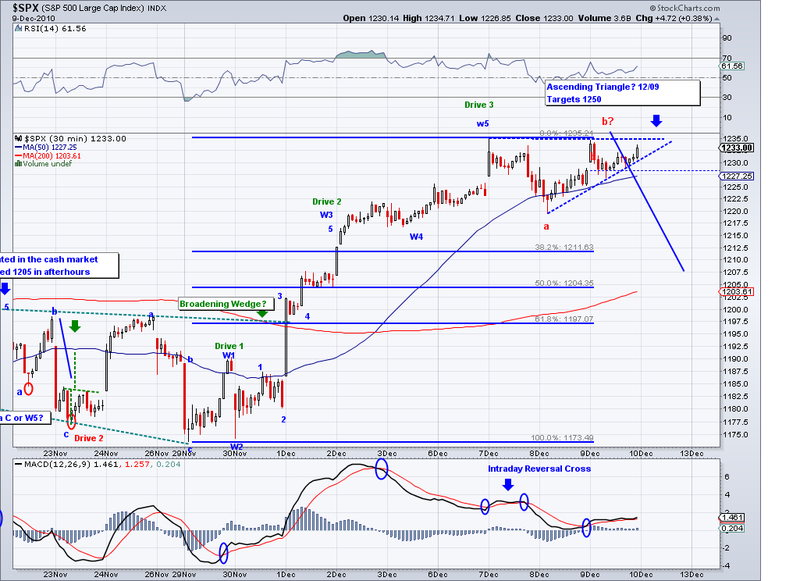 Market Update - November 23rd - Bounce to the 1190 area tomorrow? 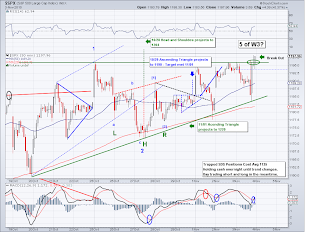 For all the commotion on the Korean issue and Ireland, the market completed a C wave that measures 1.38 of A. In other words, it looks more like normal correction than a sell off since the market did not even close the gap from 1172. 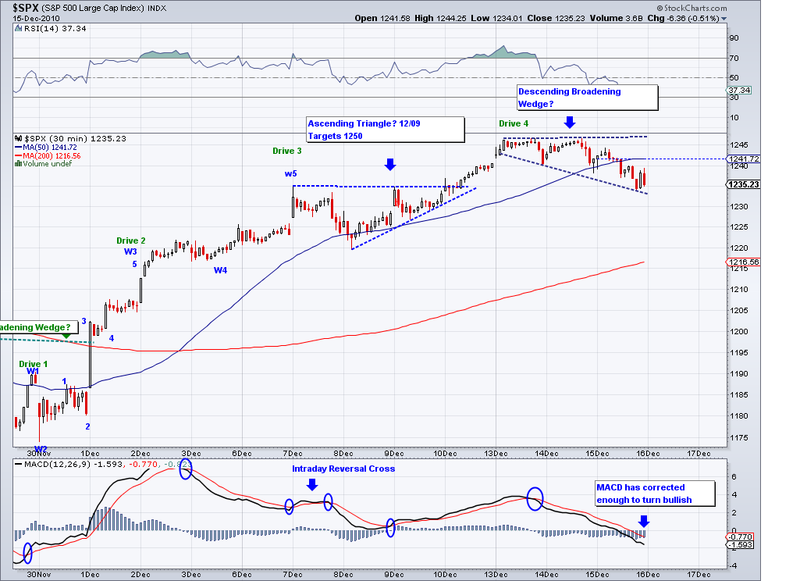 However, the market is flashing bearish signals by refusing to close over the level I watch which was 1193 today. 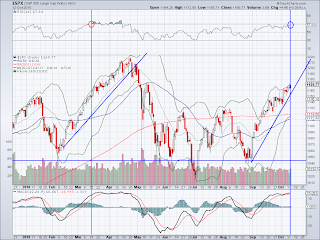 For the market to go into bullish mode again, it would have to close over the bearish trendline and not make a low below last week's 1172. 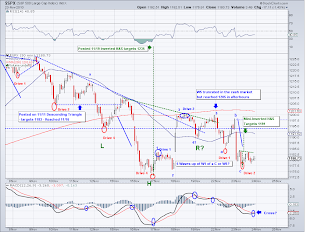 I closed my shorts today at 1185 and went long FXI at the 1181 level. And admittedly, the Korean situation does make me somewhat uneasy staying long overnight as I am familiar with the Korean conflict. I was in Seoul couple of years ago and toured the DMZ area and these countries are ready for war at a minute's notice. Technically speaking they are still at war and considering Kim Jon-Il is a little nuts I wouldn't be surprised to see some bizarre North Korean event. 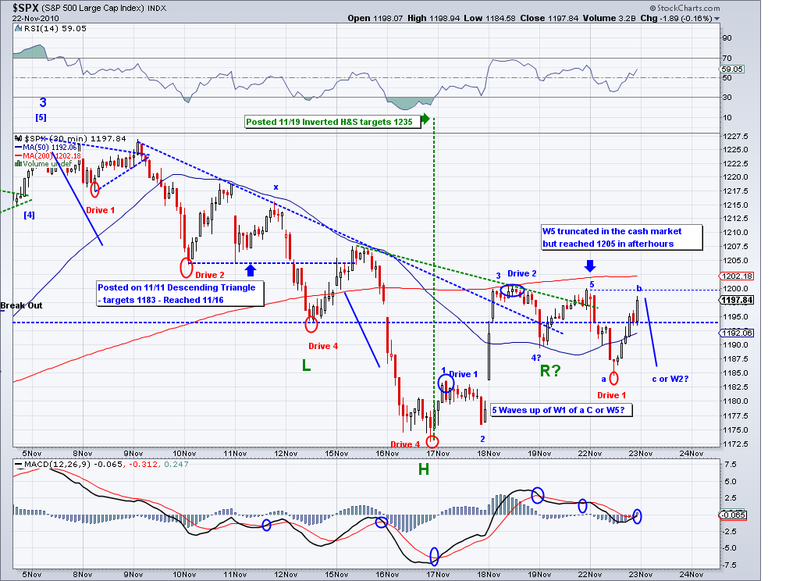 - I think a market found a bottom (at least temporarily) at 1180 but might go for the gap below and test 1172. 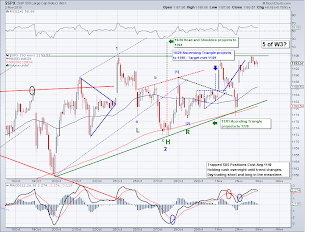 I covered my shorts at 1185 and went long with FXI at the 1181 level to play the retrace/test of the level at 1193. 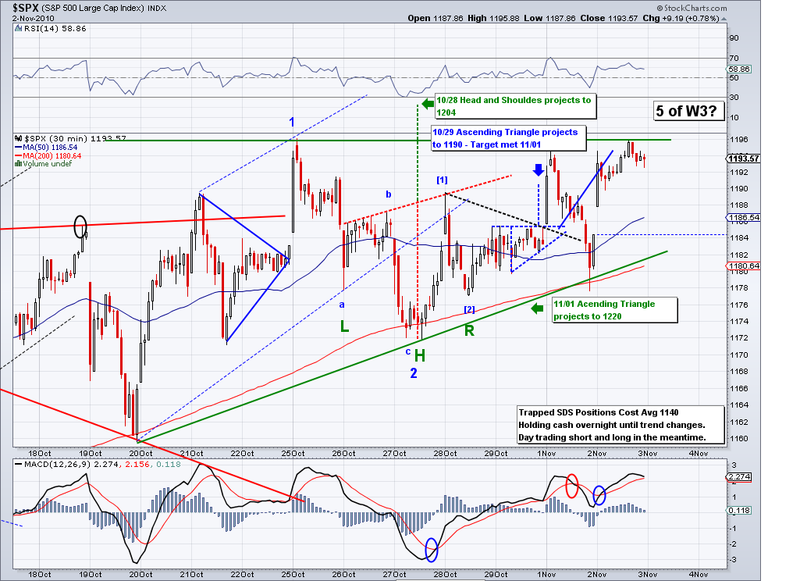 If Kim J Ill decides to go crazy then expect S&P 900's! 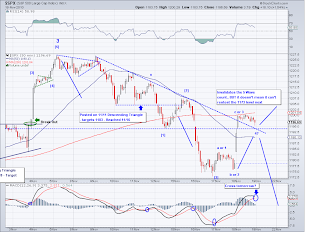 EOD Update: The end of the day was bullish and I am assuming this is the B wave of an ABC move, however it could also be a W1 in play and looking for only a Fib retrace as opposed to a C move that would take us down to 1184 again. 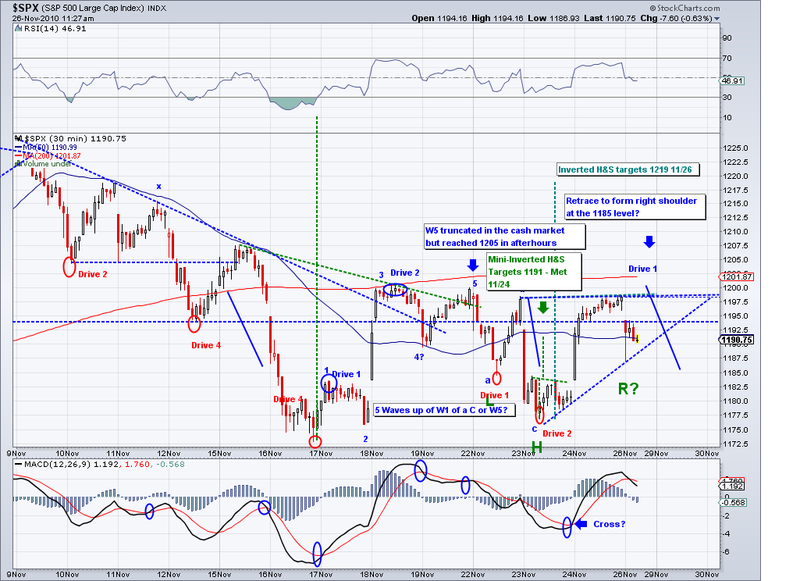 How the market behaves tomorrow will give us a clue. 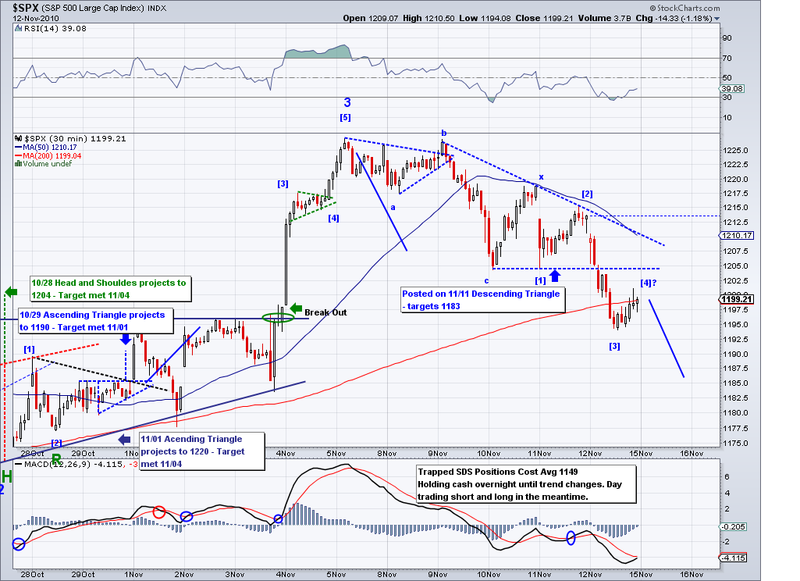 The market did end up in the 1205 area overnight but plunged by the time the cash markets opened. I was hoping I would have caught that high in the cash market to sell my longs and go short but instead I ended up selling my FXI at 44.38 for a 0.5% gain at the 1195 level and went short at 1196 and 1197. 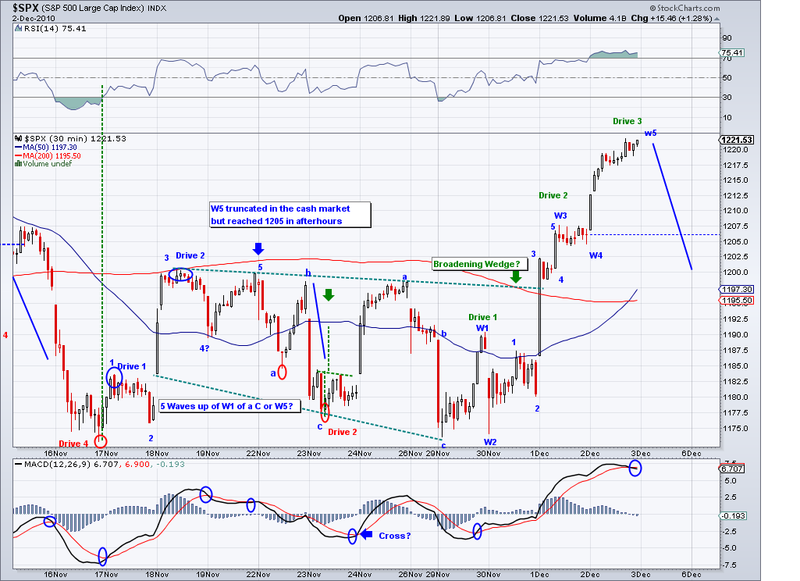 I am will start covering shorts at the Fib retrace unless it is a swift plunge like the one we saw today. But the bottom line is that it seems like we're heading up this week. 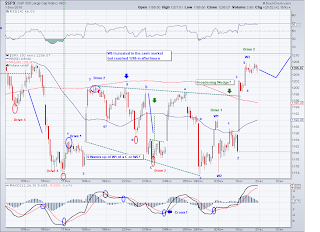 Morning Update: This could be W1 of a W3 or a C. The market did top in the e-minis last night in the 1205 area in a 5 wave move from 1173 and technically we saw the correction this morning and now we're on to the next wave. For the bull case, the S&P should close over 1197 but if it bounces off that level then we can probably expect further downside. 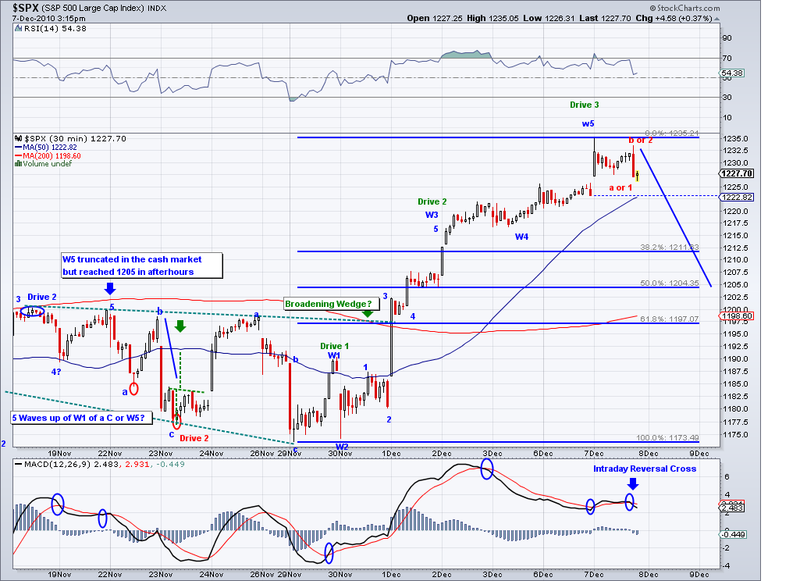 I just sold my longs from 1190 and went short at 1196 for an intraday trade. 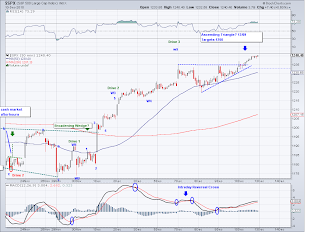 EOD Update: The market bounced off the 1190 level and managed to close over the trendline at 1199, which now confirms a short term bullish uptrend. 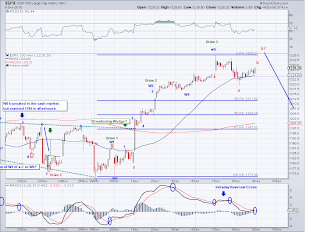 Looking at the waves, today's "reversal" is part of a W5. 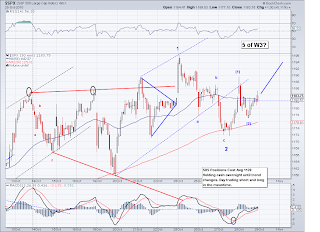 We will have a Fib correction for this 5 Waves up and then we'll get another 5 Waves up. 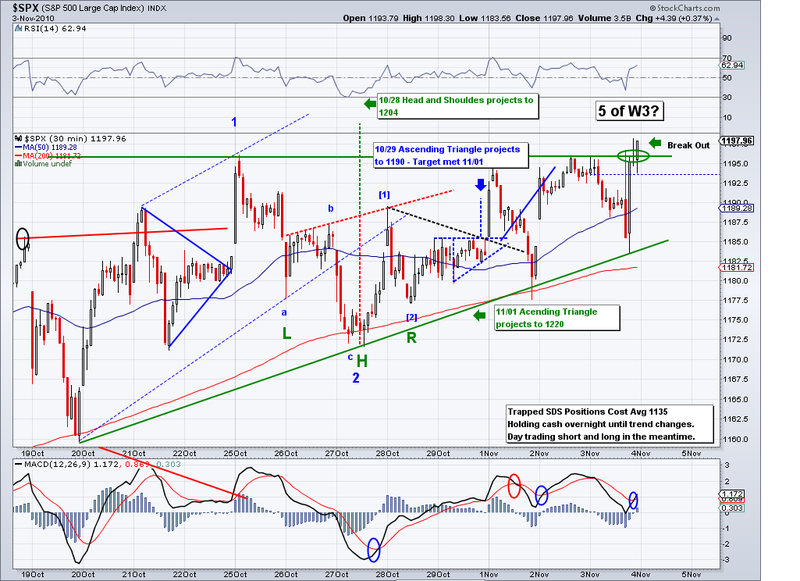 The question is if this is a W1 of W5 to 1250 or part of a C wave, which implies a corrective wave. 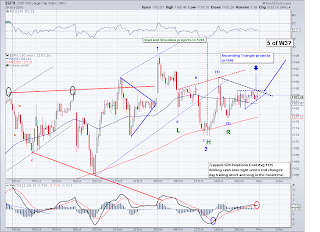 Whatever it is, the trends I analyze have worked wonders so I'll be ready when the time comes. 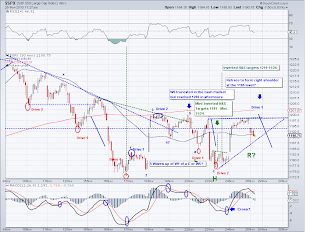 I ended up covering my shorts at 1190 and going long using FXI and will start hedging this position in the 1205 area (where I expect this last sub-minuette wave to top). 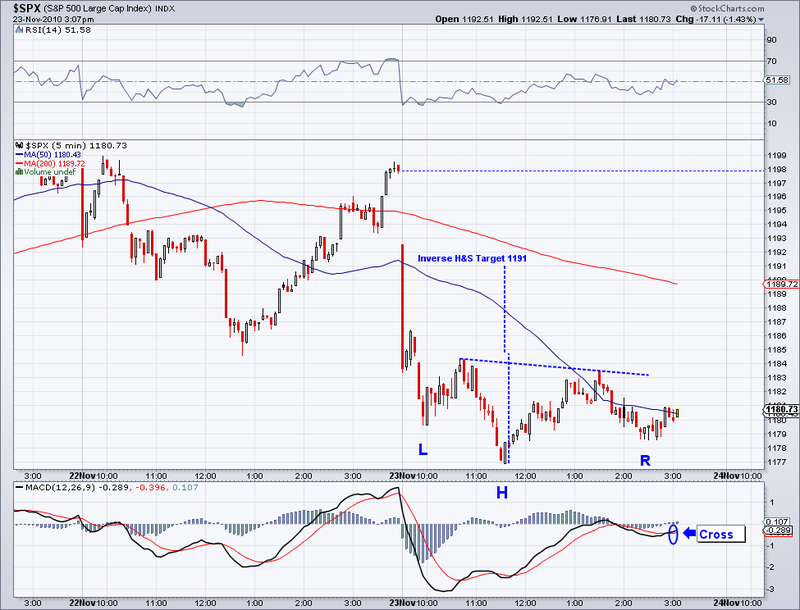 Morning Update: If the 1190 level holds, it could potentially set up the right shoulder of an inverted H&S targeting 1235. Given the fact the inverted H&S from 8/31 targets 1250, I wouldn't be surprised if this is the leg that will take the market there. 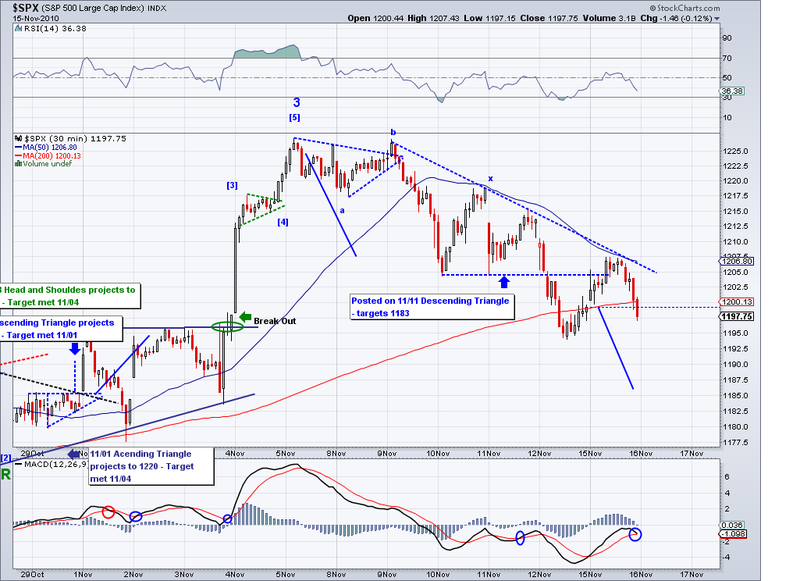 Trend is still down, so first the market needs a close over 1198 to change that. Until then I am assuming lower prices. 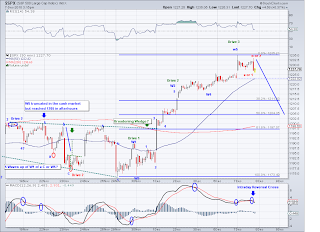 The market retraced to the 1190+ area as I was hoping and I ended up selling my longs from 1187 and going short at 1194. 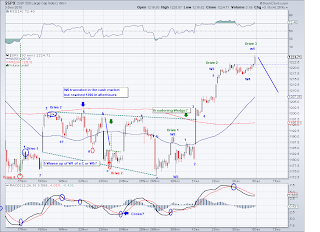 However, today's impulsive wave needs to be reversed hard tomorrow or else it will mean there is still another wave left to the 1205 area. 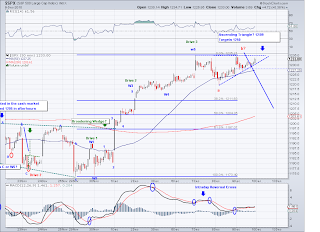 So I will be setting up my stops at break even at the 38% retrace. 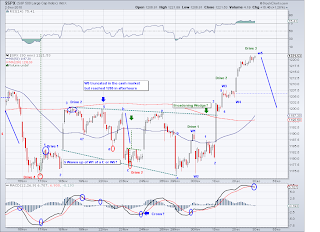 The market is no longer in a 5 wave count so it now opens up to other possibilities, what they are is anyone's guess but I will be watching the level (currently at 1202) and see how the market deals with it. The market is in a downtrend so it usually bounces off from this trendline but if it manages consecutive closes above it then the short term trend will change to positive. 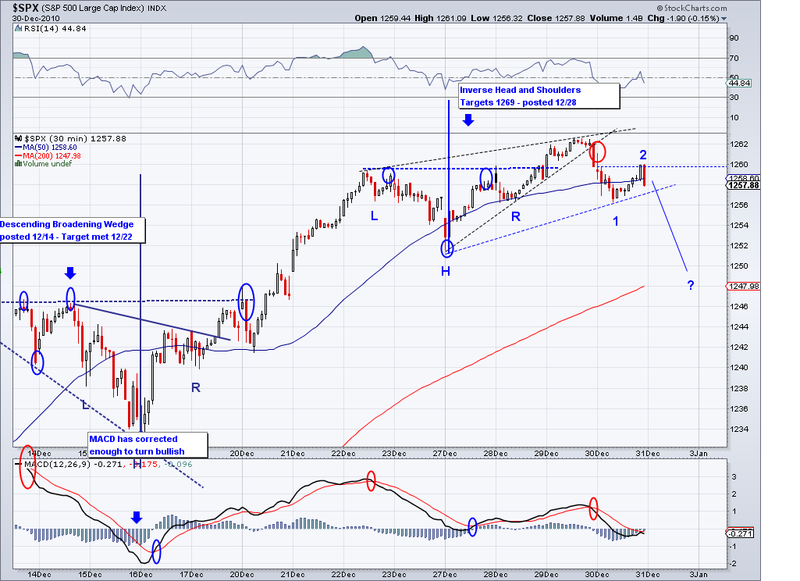 Until then, I am assuming a bearish trend and trading along with it. Markets turned today but it seems to me like there is still a "c" leg up to test the bearish trendline from the descending triangle. 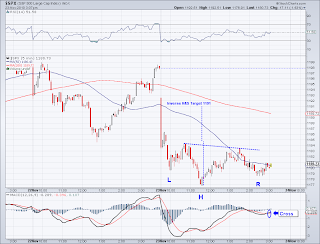 Given the fact that the GM IPO is tomorrow and euro bounce, I think it favors a leg up to the 1190-1195 area. 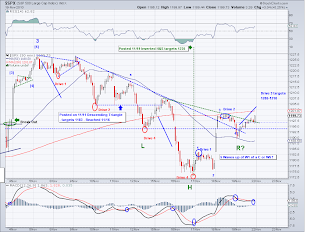 I remain long overnight and will sell and short if I am right on this "c" leg. Prices did trend down as expected and it reached the Descending Triangle Pattern target of 1183 from last week and some more. 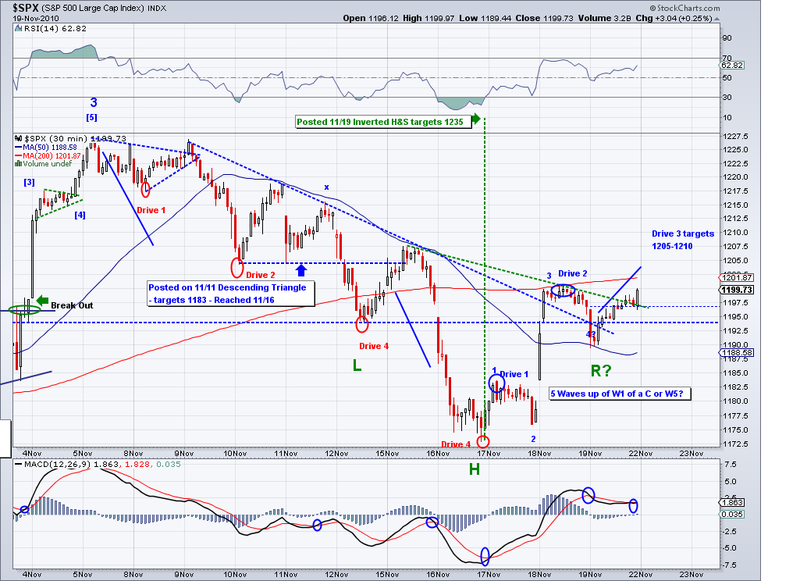 I went long at 1187 expecting a bounce that never materialized. However, I think we'll see a W4 bounce or another wave that will test the descending line from the DT to relieve the oversold condition and then continue downward. 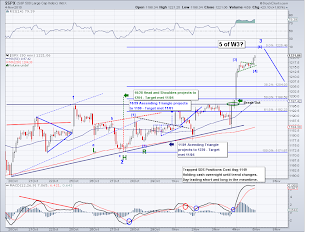 If the EW count is correct, this wave would bottom around 1155-1165. 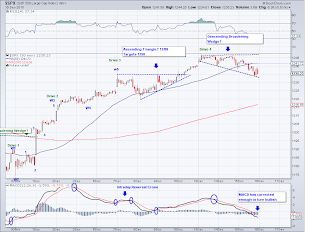 However, lower prices are very possible as long as the market does not go back to the trending level I watch which is at 1209 right now. 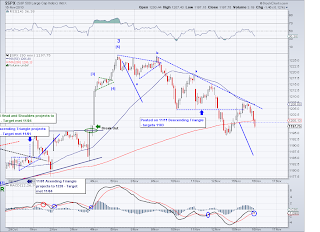 The market ended up retracing today and then reversing down. However, it retraced into what I considered W1 territory, so I removed those labels until the count becomes more clear. The market respected the downtrend from the Descending Triangle and I shorted around that area and took profit towards the end of the day. The market is going down and the level to watch is 1210 as of today, until this level is breached we can assume lower prices to come. 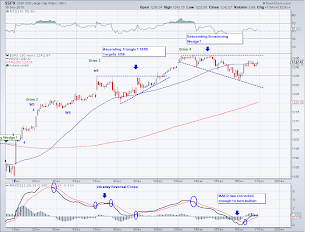 So I will probably go overnight short at the next test of the trendline. 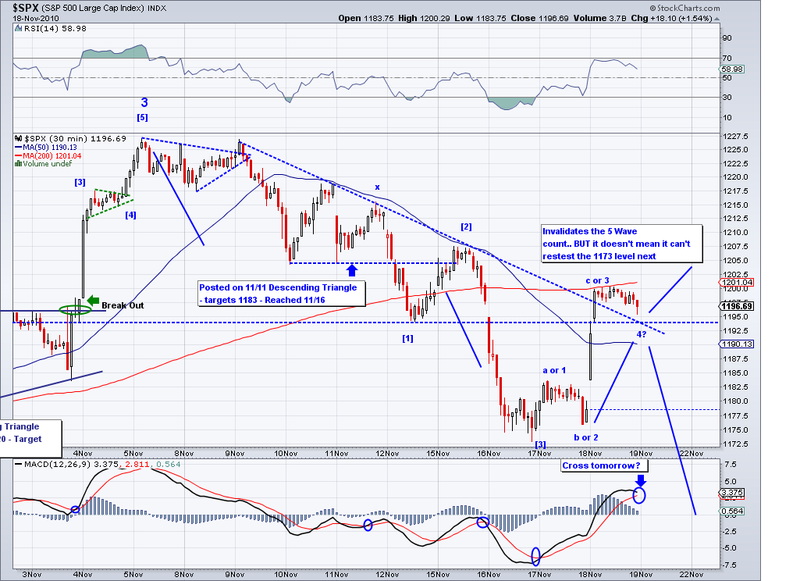 Most EW counters are calling this a corrective Wave 4with a bottom around the 1170-1180 area and it looks like it so far. As long as the we don't retrace all the way back to the 1150 level, I am inclined to think the market is just digesting gains before an end of the year bull run. 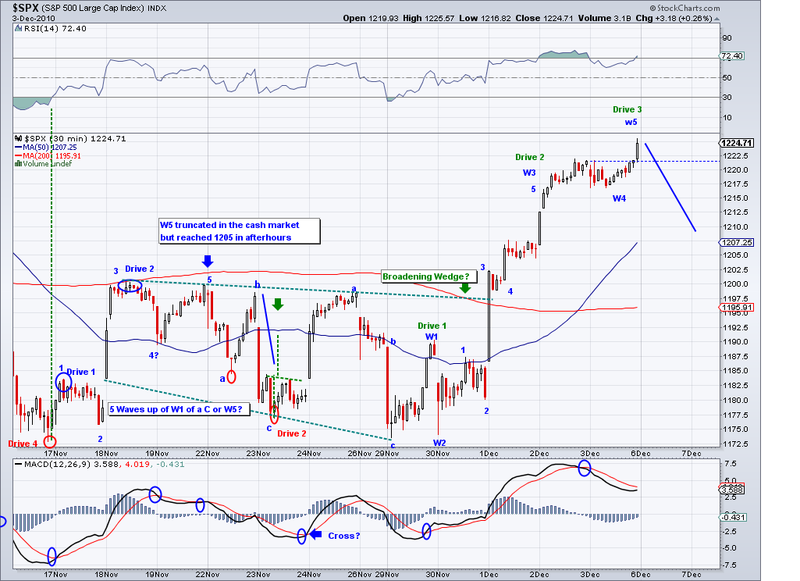 The short term trend finally changed so now I can officially call the 1227 a significant top. 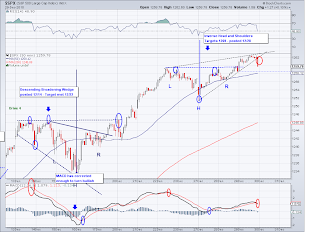 And it happened on the 10th week as I had been speculating for weeks, usually waves have time and length relationships and this one is almost a carbon copy of the February-April wave as seen on this post. 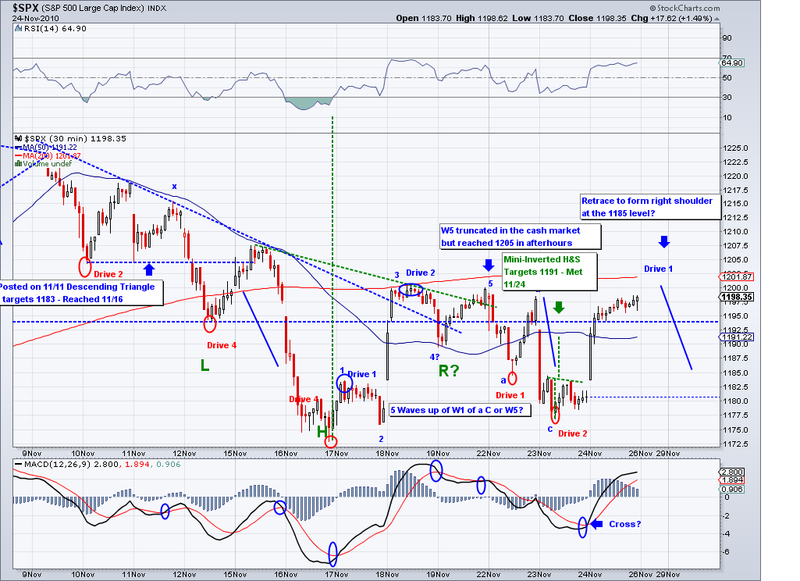 With that said, we still don't know if we are having a "mild" correction on a Wave 4 before turning up and finally topping again in the 1230-1250 area and then going into a corrective Wave 2. 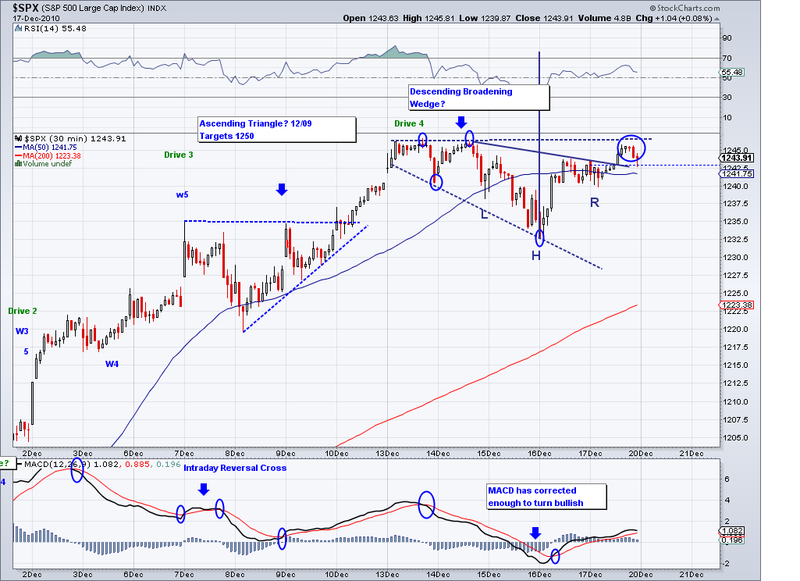 In my opinion, how this bearish wave behaves should give us a clue. 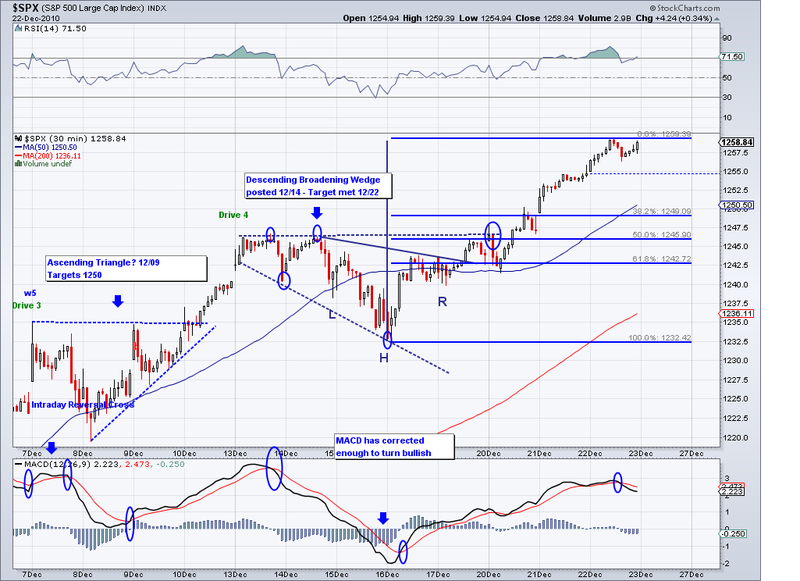 If it doesn't retrace at least 38% of the entire rally from 1041 then I will assume it is a Wave 4. But if it goes down to the 1150 area then I will label it a Wave 2, with an expectation of a massive Wave 3 that will take us to 1300. 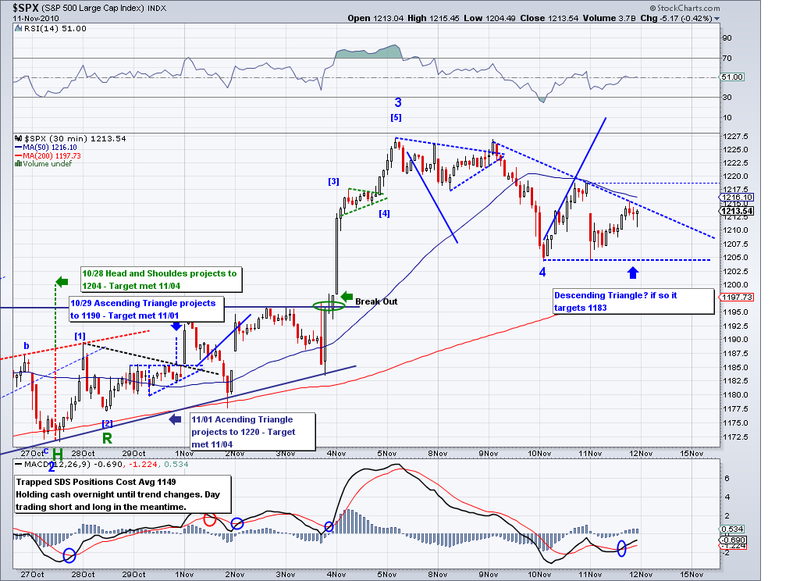 I was cautious yesterday and did not take overnight positions. And unfortunately, I got stopped out at break even during a 5 second spike when I shorted at 1209 this morning before plummeting. 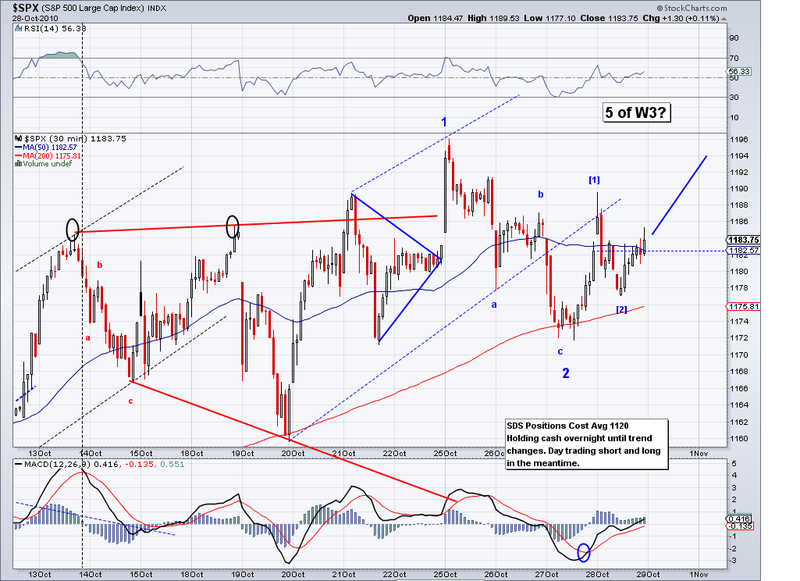 I was however able to make some money going long at the end of W3 but for being right, I didn't make much money. Lesson learned, set a 2 point stop as opposed to my stingy 1 point stops. My stops have saved me a lot of money but I think it has cost me more in opportunity costs in the end.. trade and learn! I am cash over the weekend and will be taking short or long positions on Monday. There seems to be some indecision by the markets but I think we'll have an answer very soon. I have been expecting prices to go up to the high 1220's/1230 level but the dollar strength hasn't helped and neither has earnings. 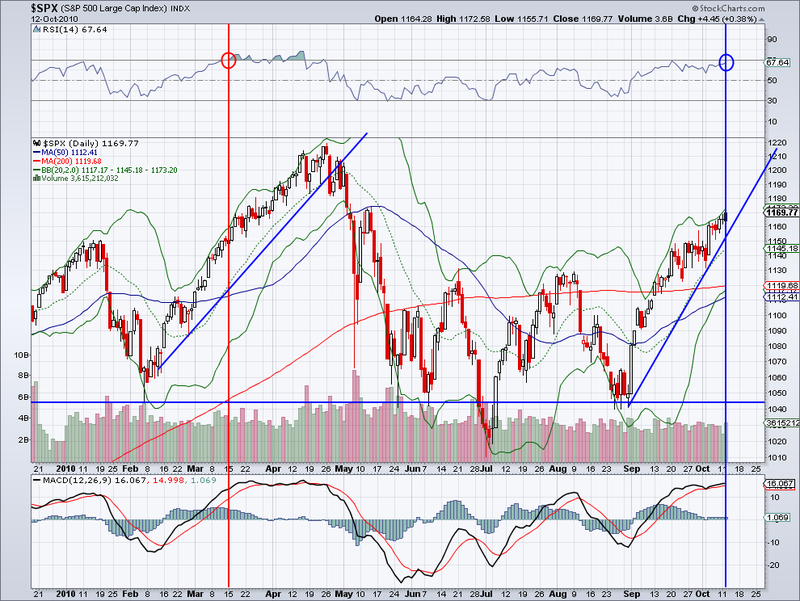 So perhaps the top is in for this rally, the 10th week as I had been saying for weeks? There is a Descending Triangle targeting 1183 and there is an Ascending Triangle targeting 1217 so the market is not very clear. I almost stayed short overnight but didn't do it because we are still above the bullish trendline and there was a cross on the MACD, if we go below than level tomorrow I will stay short and especially if the 1204 support breaks. In the meantime, I will continue to assume this is a W4 and that we are still going up since the market keeps bouncing off the levels I've been posting. 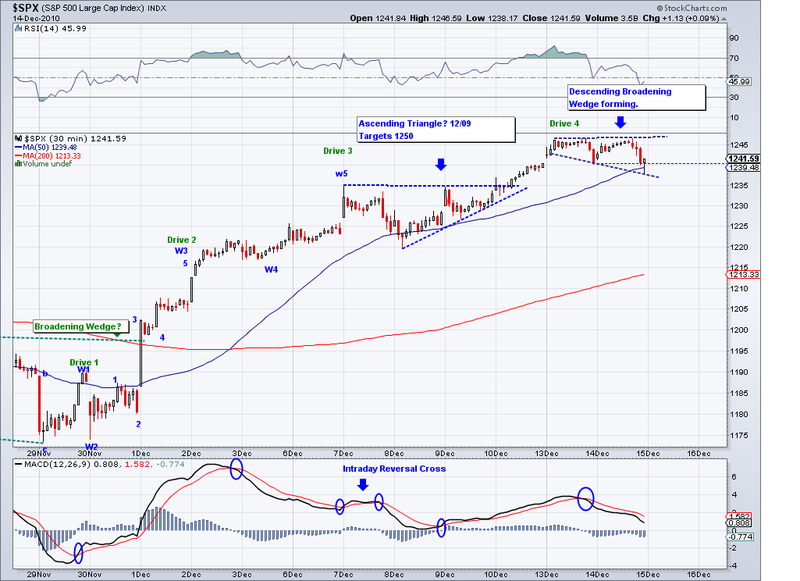 I haven't changed the chart at all and the market just followed the levels and the blue lines I marked. 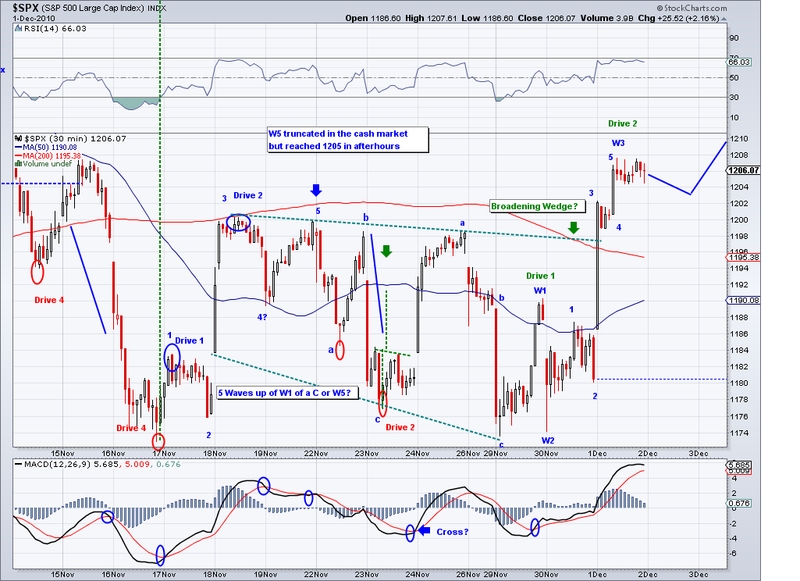 The market bottomed at the 1204 level mentioned yesterday and bounced off over 1% to close at 1218. 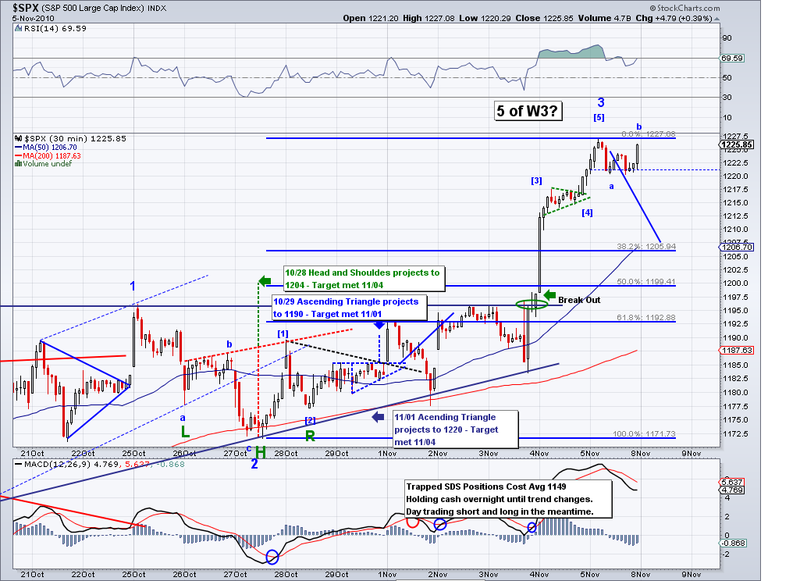 I now expect a 38-50% retrace of that wave to set itself self up to go into the 1220's area in a W3 of this last W5. 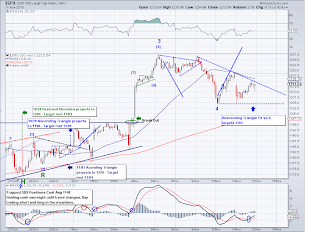 I assume the market will sell on the Cisco earnings but will regain its footing. 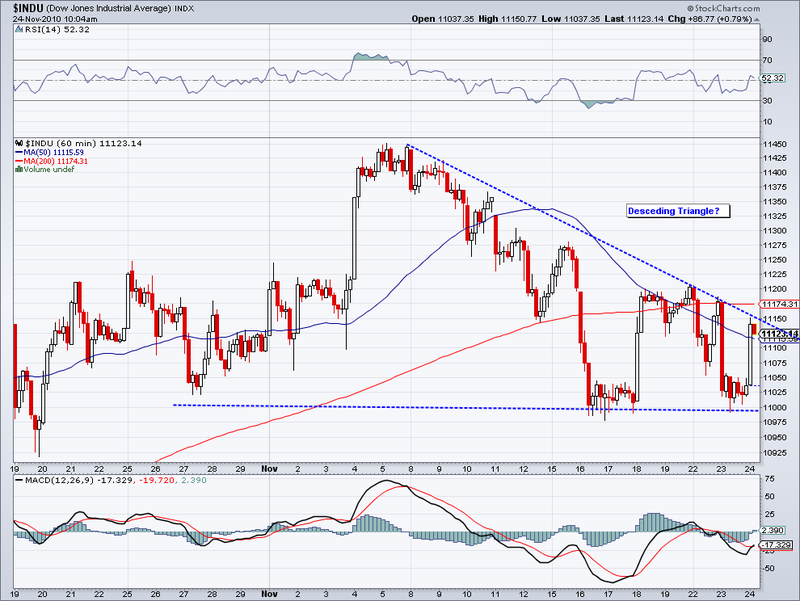 However, if the market can't shake those news then I'm looking at 1206 as the level to watch. 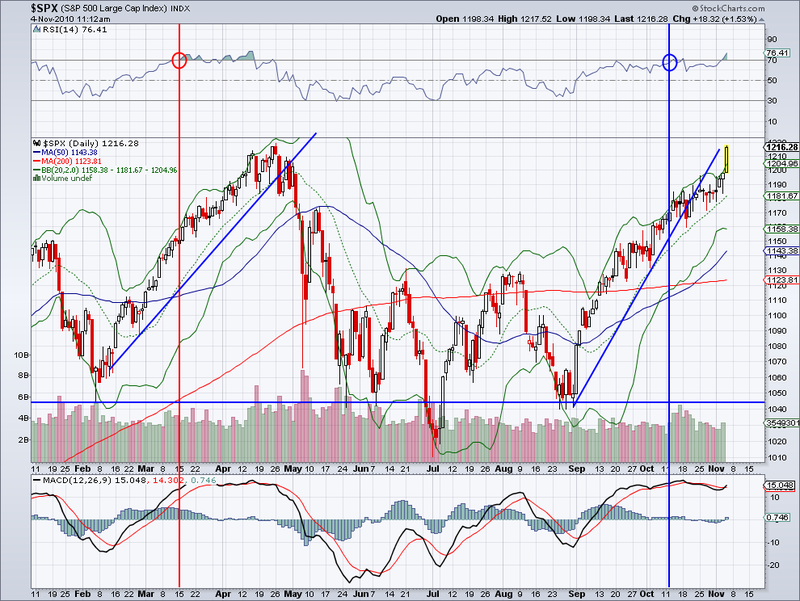 Any closes below it will change the trend from bullish to bearish. 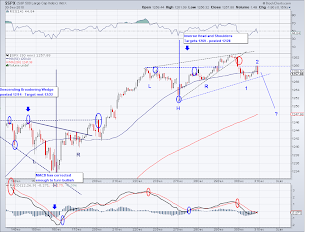 The market ended up going down as I was expecting and I am seeing this as a correction or W4. 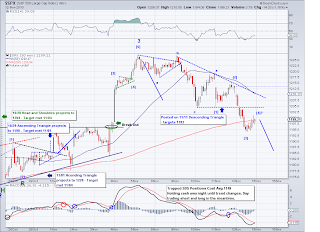 Traditional technical indicators confirm a downtrend with this close but given the fact that we ended up over 1204 and the trend is still pointing up, I am assuming there will be a 5th wave that will take us to high 1220s/low 1230s and not the real correction many shorts have been looking for. 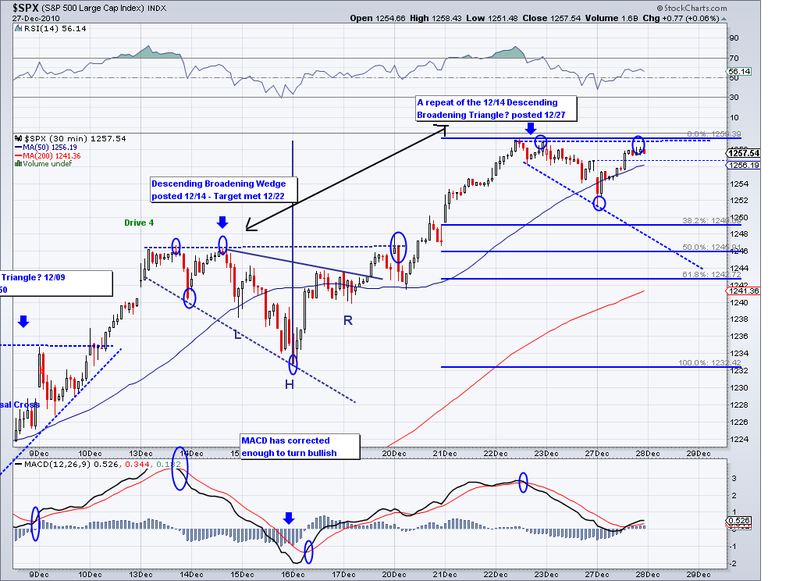 It would be interesting to see the market top at 1234, which is a number I posted several weeks ago. 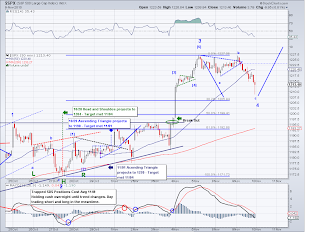 But all looks like a 50/50 now, Elliott Wave vs Technical Analysis. I went hedged today per my plan yesterday. So hopefully we'll see that one more rally and then a sell off. This is the 10th week of the rally and I've been saying for about a month that this could be the week where we top. But that is just speculation on my part, I am inclined to think the market likes to repeat itself in time and prices so it will be interesting to see this actually happen. We are still above the bullish trend and any pullbacks that stay above "the level" should be considered an opportunity to go long or cover shorts to improve avg cost. 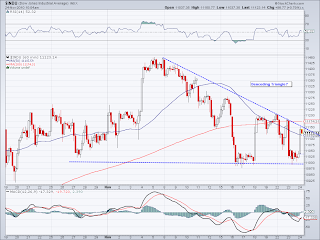 Today's negative close showed there was indecision in the market and given the fact the dollar has dropped to levels where the market was at 1180, there is a possibility of a pullback starting in the next couple of days. 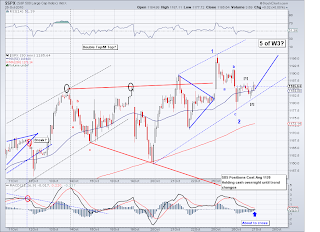 However, I can't ignore the charts and they are pointing to either a W4 triangle that will land us in the 1230+ territory or an ABC with a sell off about to start. 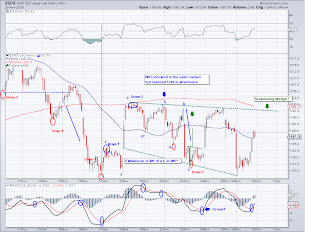 Either way, I am expecting a pullback tomorrow morning and since I am holding overnight shorts, I will cover only if we do not close under the level on the next intraday pullback. 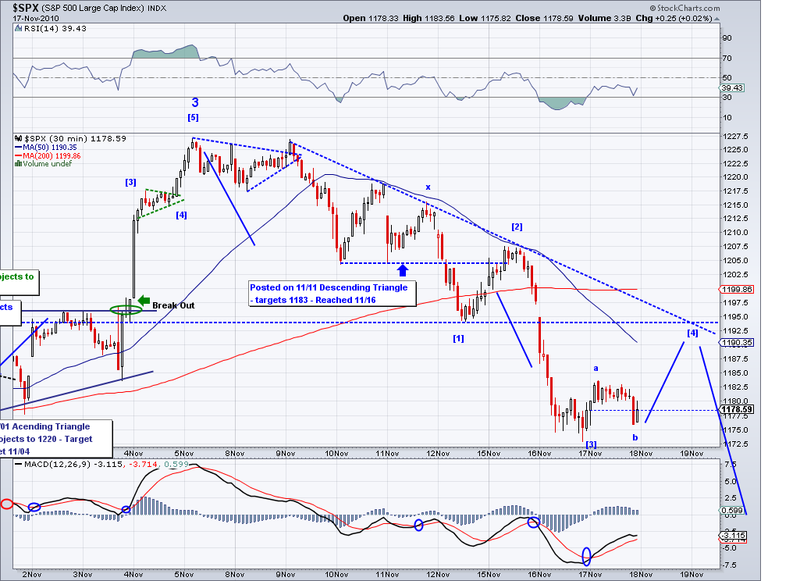 I was perhaps premature in shorting at 1213 but it is still a safe level considering all other factors. 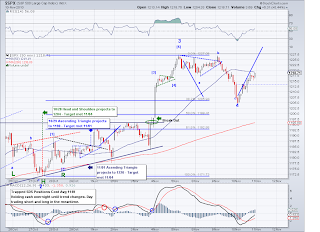 The market reached the bull flag target and at 1227, I suppose the market has gotten close enough for the 1234 target I posted weeks ago. 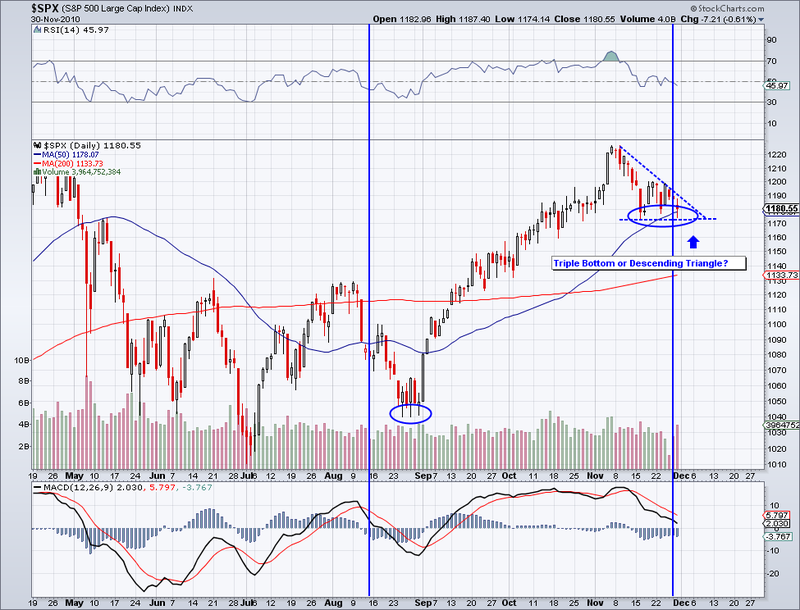 Next week will be the 10th week and I am speculating the top is in already or next week. 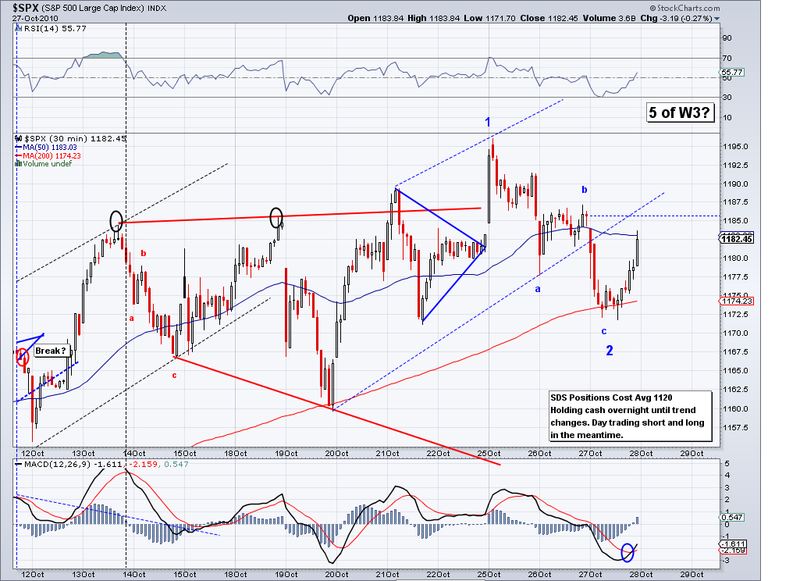 Of course, this could be the end of a W3 and go down to the 1200 area before going to 1250. But seeing how much the dollar gained today (basically it gained what it lost the day of the rally), the conditions are in for a reversal. That and the fact that the market is overbought and all the news that investors had been waiting for are all out. 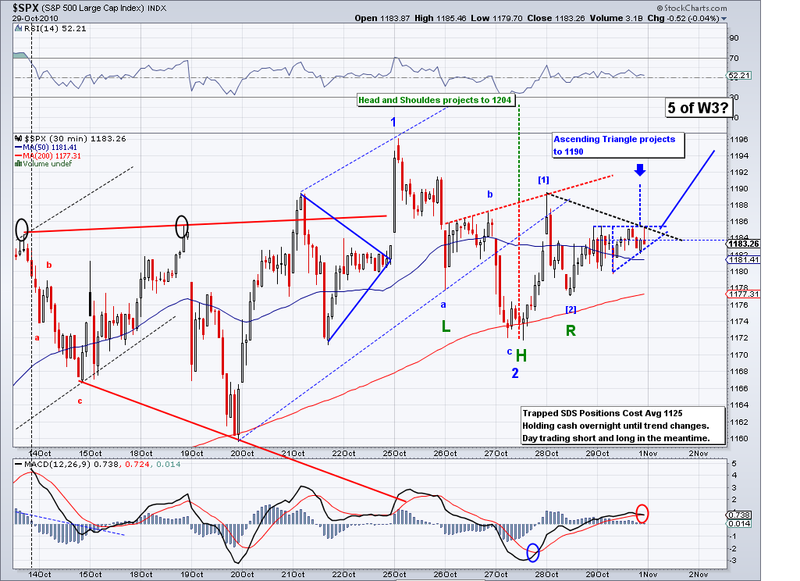 I am leveraged short and covering at the 1200 area if we get there in a corrective manner. But I will not cover if we breach the level posted.. we'll see. 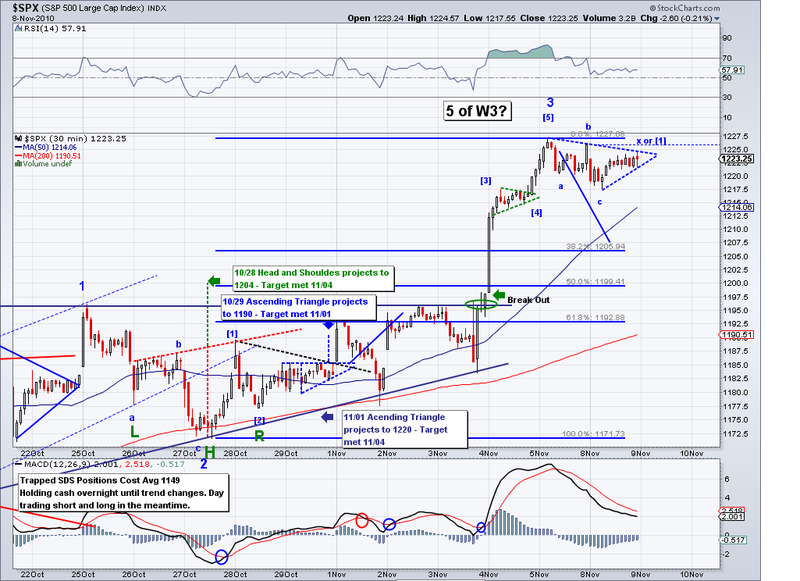 I was expecting the market to gap up in a W3 Ascending Triangle break out and it did so in full force. 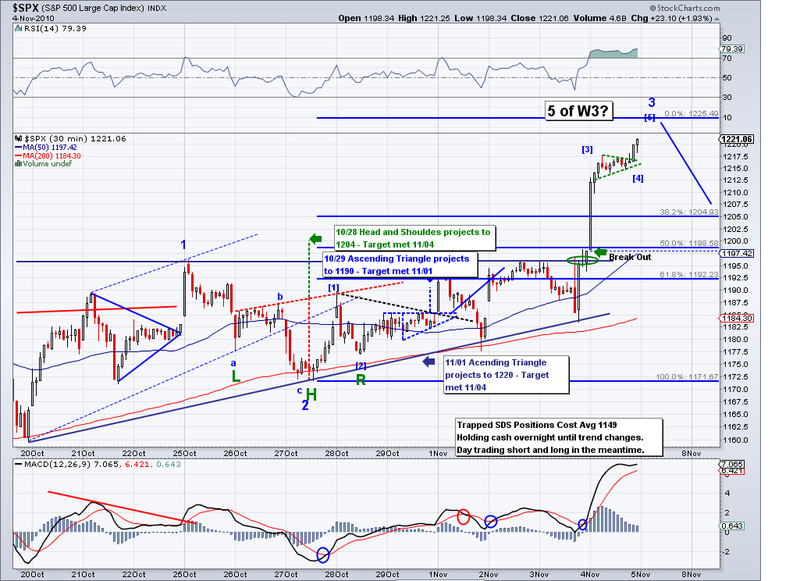 All the technical pattern targets I had been posting for days were reached today. 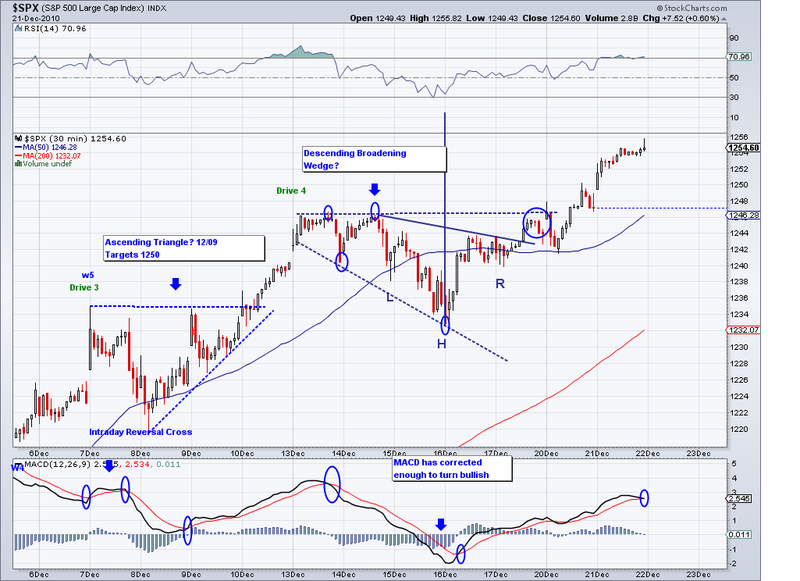 I think it's funny how 1196 held for weeks and next thing you know we have a 20+ point close above that. 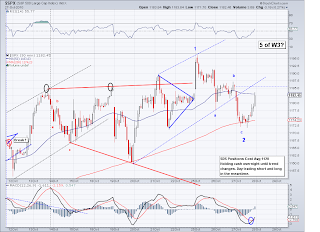 Anyway, I see the 5 wave pattern done or close to being done before going into a correction to the 1200 area and then another launch higher to the 1234-1250 area in a W5 (If there is a 5th wave left). The market is now equal in length to the Feb-April wave and the only difference is that we are at 9 weeks vs 10 weeks on that rally. So once we have time and price satisfied, we should see a turn. But as I tell myself everyday, as long as that number I put up on the right hand side of this blog does not get closed under the trend is UP. 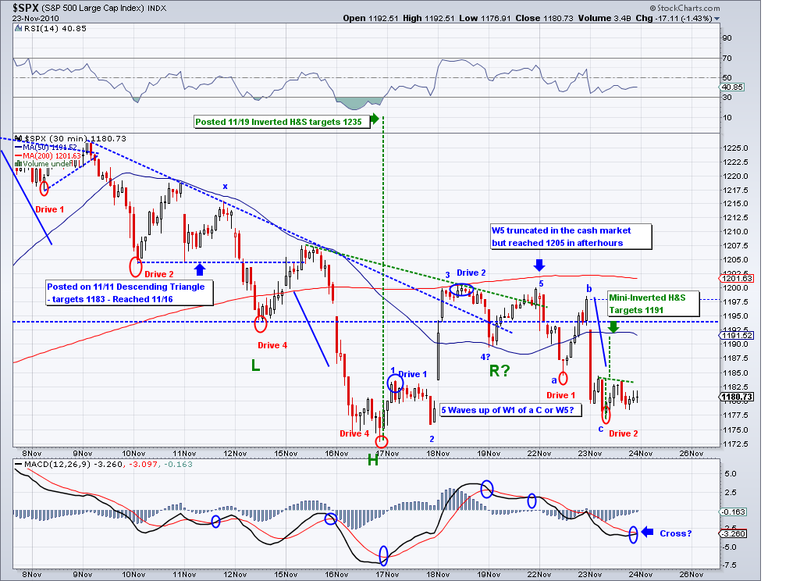 I went short at 1213 today without stops and I am holding overnight short positions. 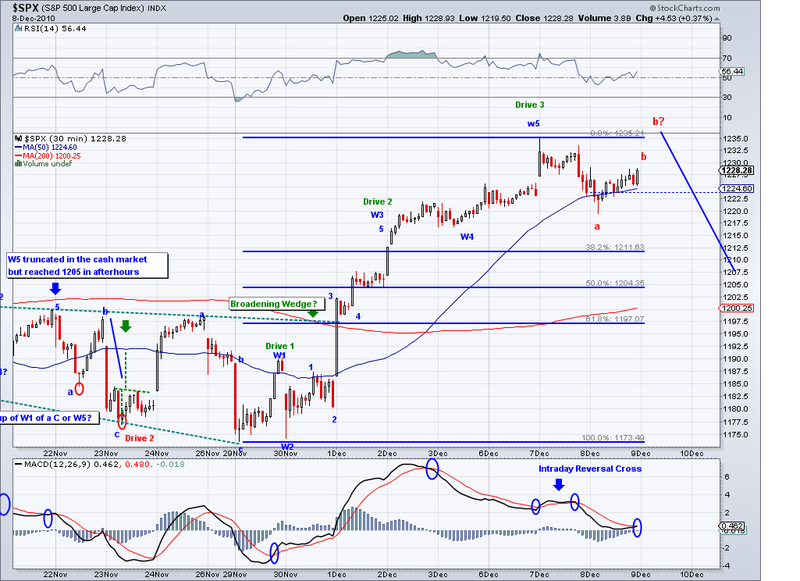 Now that we are testing 1219, I think we are close to the top of the rally from 1041. 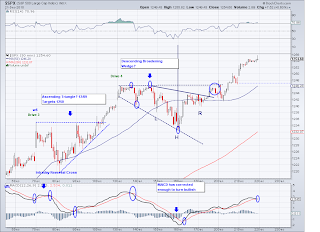 I posted about a month ago that there were similarities in the Feb-April wave in time and price and that there was more upside to come. And now that the price element has been reached, we have the time element left. 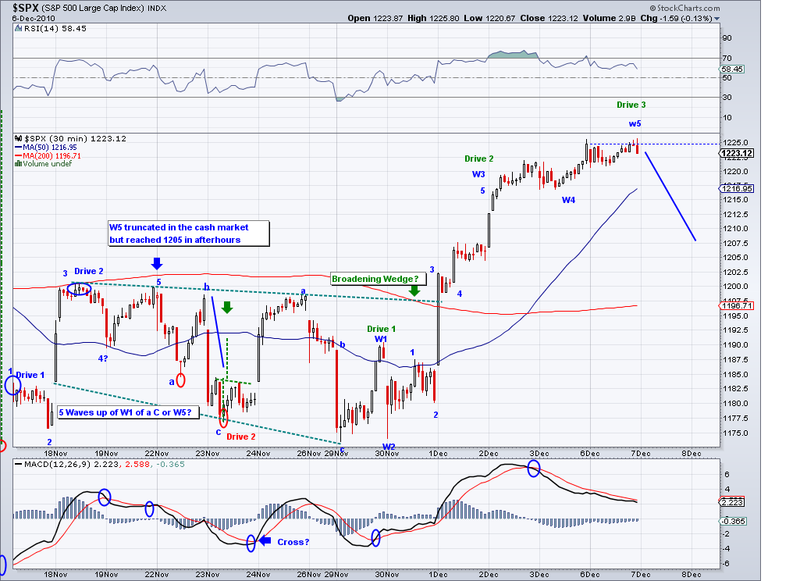 It's hard to call a top when the trend is clearly up but my guess is that we will find a top between here and 1235. 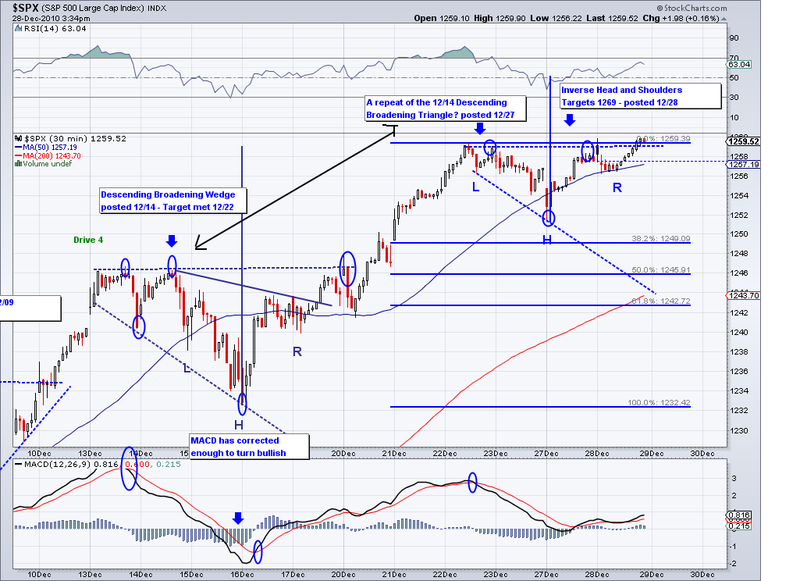 Feb-April rally was 175 points and 10 weeks in duration. 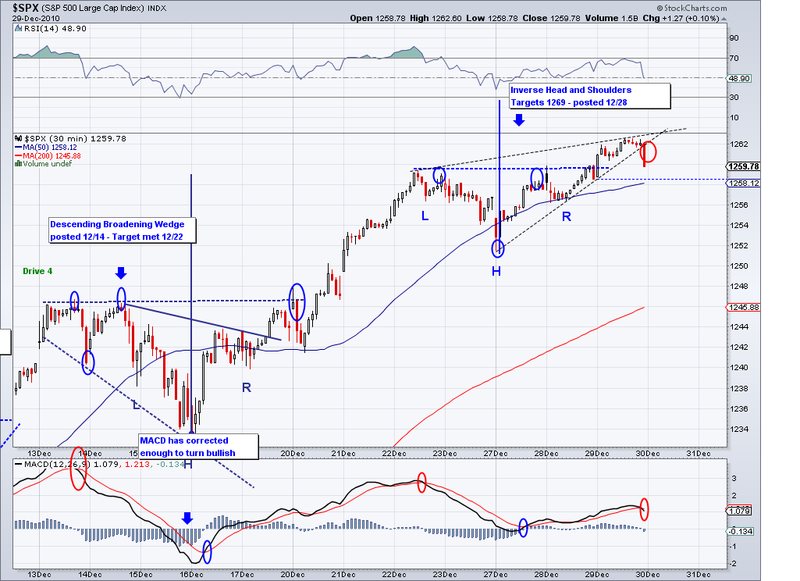 The current rally is 177 point and 9 weeks in duration. 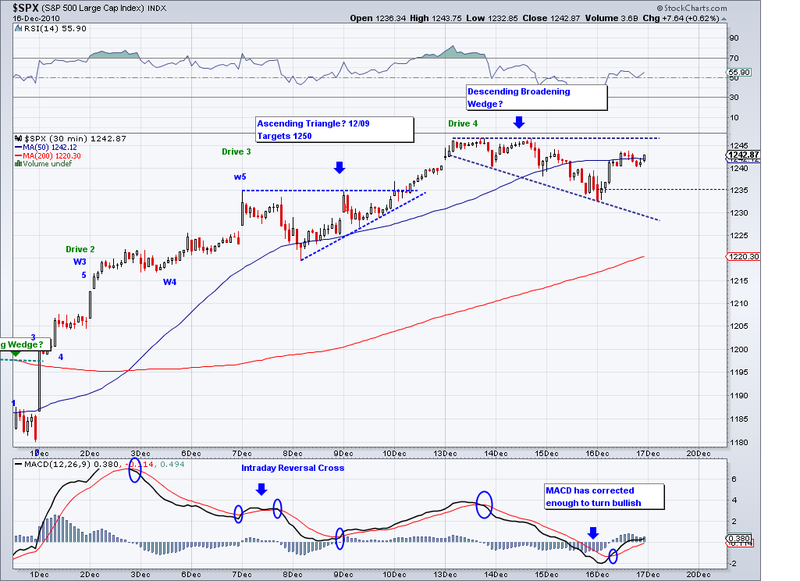 As confusing as the market appeared to be today, all the action took place inside the trendlines drawn days ago. 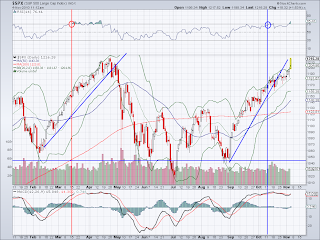 The market tested the lower trendline and stopped on it as if everybody watching that line. 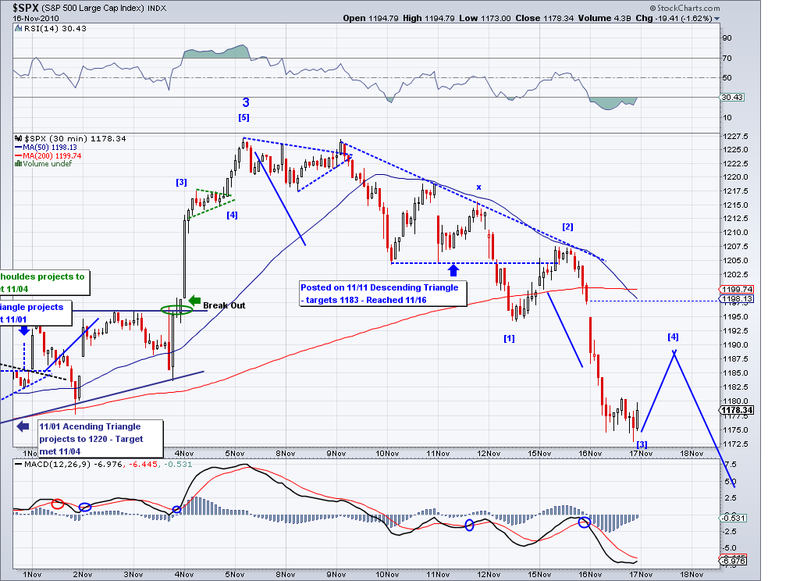 And now that 1196 finally broke, it seems like the market will make an move to break out of the triangle tomorrow. 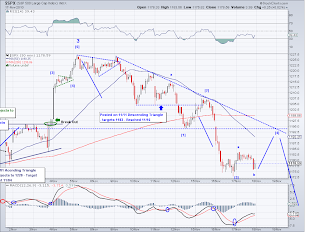 It could well test that lower trendline again but based on the EW count, it favors a gap up. 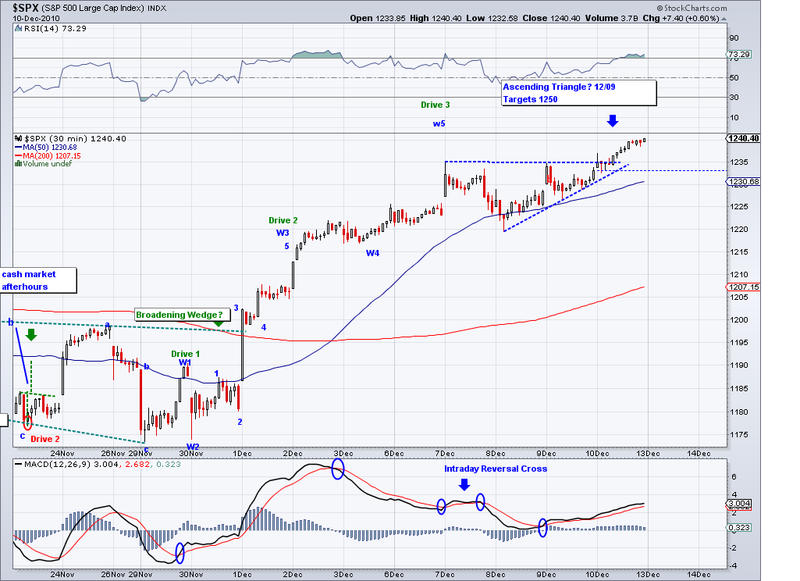 The level to watch was visited just briefly, a few seconds if that and it worked great as a spot to go long. 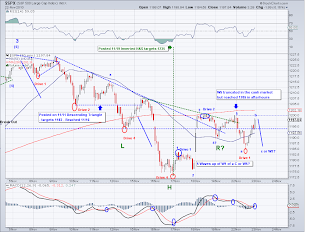 I broke my own trading rules today by going with "hunches" and reading the news too much. So I ended up losing on 2 day trades but I am all cash again and learning from my mistake. Short only at extremes in an uptrend, long only at test of trendlines and oversold extremes if the market is above the level I watch. Had I followed my own advice, I would have had a very good day. 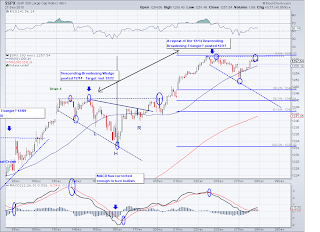 The market finally closed over 1185 and we now have technical patterns that point to higher prices. 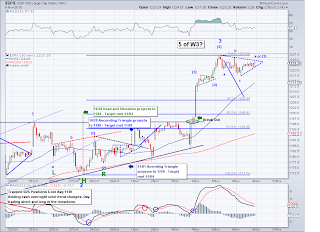 We have a larger Ascending Triangle with a 1220 target, an Inverse Head and Shoulders projecting 1204 and today a bull flag pointing 1201. That's in addition to the gap from April 1197-1202. So I am in cash and waiting for a good spike to short and unless these targets are met or the trend changes and closes under the level I watch, I will stay in cash and only trade extremes. 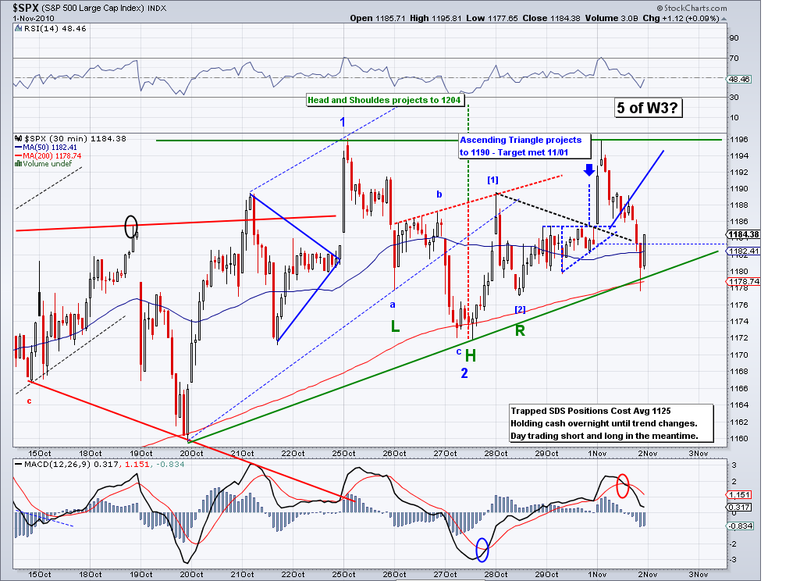 It'd be great to see a big spike to the 1220 area as I think that is where the rally ends. 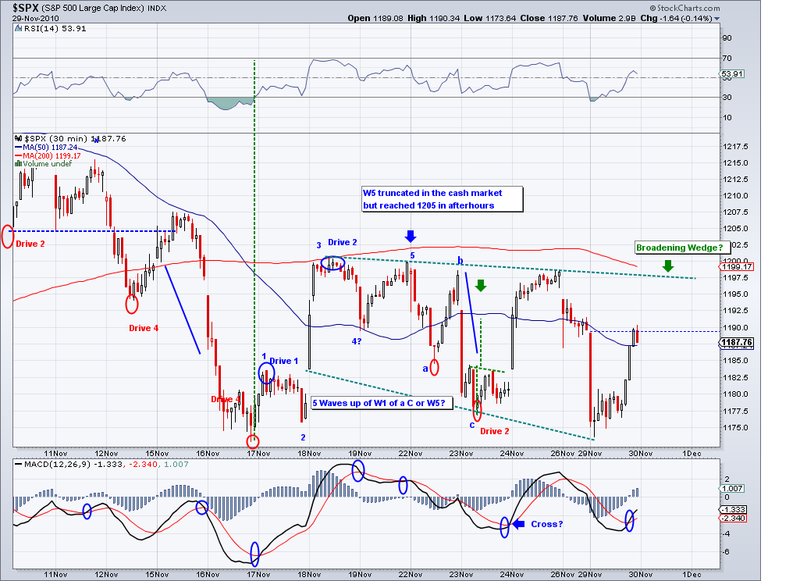 So the market gapped up to the area I was projecting but then it reversed deeper than I had expected. 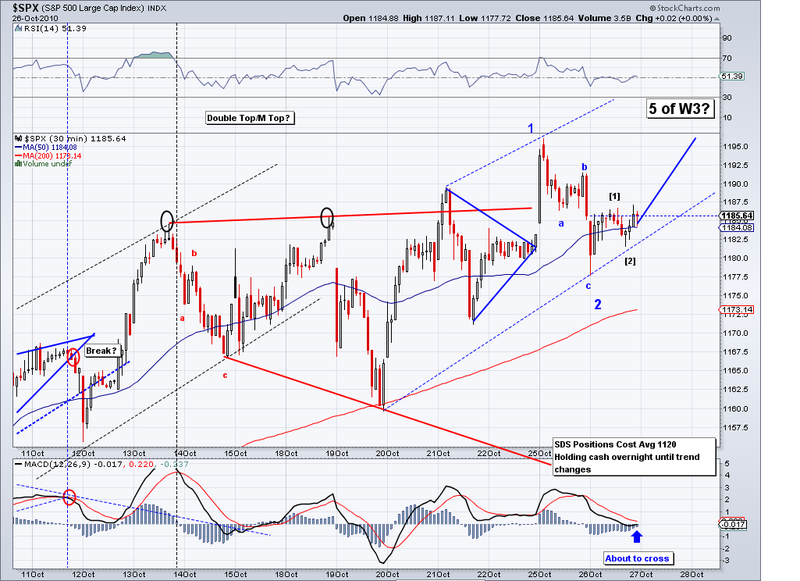 In the process, the market formed a potential Ascending Triangle that targets the 1220 level on the S&P. 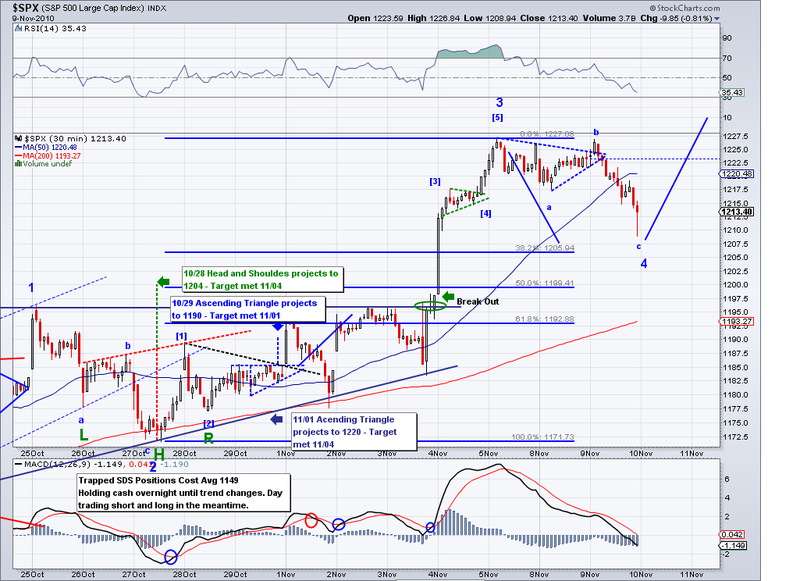 The Elliott Wave count is technically still valid but we would have to see a huge rally tomorrow to confirm. 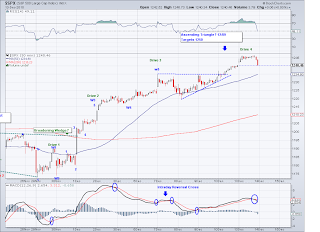 I entered the market short in the morning at the gap but a bit too early so ended being stopped out at break even. I also too another long position that got stopped out at break even and during the last minutes I got stopped out of a third position at a -0.3 loss. So I am hoping to have a better day tomorrow. My goal is to have a 2 to 1 positive to negative day trades so we'll see how this week goes. 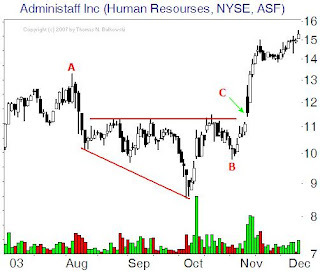 I will be again shorting at gaps and going long at support levels. In the meantime, I am staying 100% cash.